The South Burnett Regional Council has given the thumbs up to a plan to connect the Brisbane Valley Rail Trail (BVRT) to the South Burnett Rail Trail (SBRT) via Nanango. At Wednesday’s monthly Council meeting, Councillors voted unanimously to agree to a plan put forward by Heritage Bank Nanango which will effectively create a continuous 280km trail between Wulkuraka and Kilkivan. The “Rail Trail Link” will join the BVRT to the SBRT and the Murgon-Kilkivan trail by using an old stock route between Yarraman and Nanango, then rural roads. The stock route was used by Nanango graziers to get their animals to Yarraman Railway Station between 1913 and the 1950s. It is believed to follow a route railway engineers surveyed for a proposed rail connection between Nanango and Yarraman in 1913 that was promised by the State Government but never eventuated. After the stock route, trail users will be able to travel from Nanango to Kingaroy via a second, signposted route along back roads between the two towns. The plan to link Yarraman to Nanango was first devised by former Nanango Tourism and Development Association president Barry Green in February. NaTDA arranged to have signs outlining the history of the stock route erected near Yarraman to encourage cyclists, walkers and runners using the BVRT to press further north. 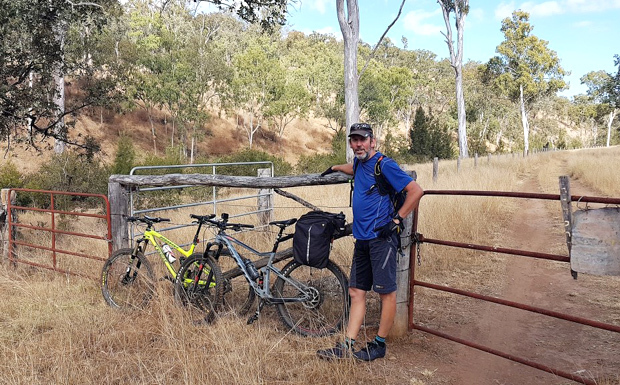 The proposal to link Nanango to Kingaroy was put forward by Heritage Nanango Community Fund board member David Kenny, who is also a keen cyclist. 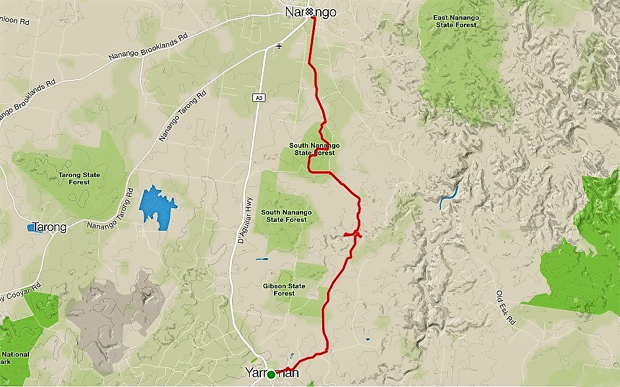 Because the original Kingaroy-Nanango railway land was sold after the line closed in 1964, he has mapped out an alternate route that would allow cyclists to safely travel the 20km separating the two towns. David told southburnett.com.au he thought it made sense to connect the two trails, even though they’d never been connected in the railway days. He said joining them would create the longest continuous trail in Queensland. The BVRT had turned into a magnet for tourists over the past few years. The South Burnett Rail Trail, which opened last October, has also seen a rapid uptake by locals and tourists. He believed bridging the gap would encourage cross-trail tourism between the two, and also put the route at the top of every rail trail enthusiast’s “bucket list”. The South Burnett Rail Trail Users Association (SBRTUA) also praised the decision. SBRTUA president Dafyd Martindale said Mr Kenny had brought along Heritage Bank’s proposal to the group’s recent public meeting, where it won immediate support. “We know how heavily used the BVRT is, and our aim is to see the SBRT get to the same level as quickly as possible,” he said. “That can only be good for our region in the long term. The new sign-posted route is expected to open in the first quarter of 2019. Just wondering this can be used for horses as well as bikes? Well done to the Nanango Mountain Bikers and Heritage Bank who have worked so hard to bring this to fruition. Nearly makes me want to pump up my tyres and get back on my bike … nearly. Sounds alright. Can’t understand why it isn’t open to horse riders. Should probably allow camping also. It’s the only way to boost tourism, and the local economy. Otherwise it’s really only locals doing a little run or bike ride and while that’s great for some, it could actually be reducing money that would have otherwise been spent at a local gym. Perhaps horse riders could be asked to ride to the side of the unnecessary bitumen track. End of the day it’s not that hard to go around some horse poo. And end of the day it’s currently a whole lot of money being spent for no economic gain. I can’t see bike riders and joggers doing the whole thing, spending money along the way. Allow horses and you may have a chance of attracting city horsey folk out into the bush for a week enjoying some coffee and local produce along the way. Horses are allowed on the Yarraman-Nanango section, the same as they are on the rest of the BVRT and the Murgon-Kilkivan section of the trail. The only reason horses are not allowed on the section between Kingaroy and Murgon is that it crosses the Tick Line. This is great news! I was planning to do some of the BNT in the new year but will plan to ride this on the bike instead. Does anyone know when it will open in the first quarter? Yaaaaaay! ….. this so needs to happen! It will be so good to have all the trails linked – people will be able to do multi-day tours! I hope a camping spot will be able to be included in the section too, and I will look forward to riding from start to finish on all these trails once completed. Well done to get this happening. The next step would be to be able to have the trail system continue on to Theebine and finally finish up at Gympie. This would provide a great finishing point for people doing a multi-day tour to resupply their stores. It would also be a great pick-up point (if needed). Gympie also has the Mary Valley Rattler to link up the rail trail theme and promote tourism in the South Burnett and Wide Bay areas. Someone commented that they don’t see cycle riders doing the whole trail. I beg to differ. I see a lot cyclists trying to find a safe haven to ride away from cars. I, myself, tour very long distances as do many Australians and visitors, as well. And this trail will be a welcome relief in that aspect. I personally would stealth camp on the trail, and it would be part of a longer trip for me. And, yes, horses also need a safe place to ride away from traffic. It is not only cycle tourists that will use it, their will be Randonneurs, gravel, cyclocross and mtb. All will wish to ride the whole trail. It may not be as hard as the Munda Biddi, or as famous, but it will be a drawcard for Queensland as is the Munda Biddi is for WA. Congratulations to Nanango Heritage Community Branch for supporting this worthwhile project. I have a comment on the route. The original survey from Nanango to Yarraman did not follow the stock route through the Din Din forestry but was close to the current highway. One can still see the remnants of the survey from the highway. Sounds awesome 😀. Then you can all stop at Yarraman Bakery and have a pie.